This screen allows the Admins for your Atrium site to manage database settings that previously required someone from LSP Ware to change for you. 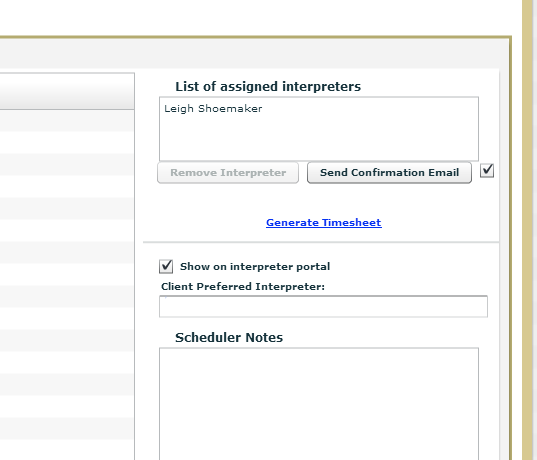 Interpreter can pick an open job from the portal: There is a column on the interpreter portal which will display available jobs for which the interperter is qualified and allows him to assign himself to them. If you do not want the interpreter to have this ability, then turn this setting to No. Deadline for online changes of job by interpreter: This primarily determines how close to an appointment an interpreter is permitted to cancel, since that is the only change an interpreter can make at this time. 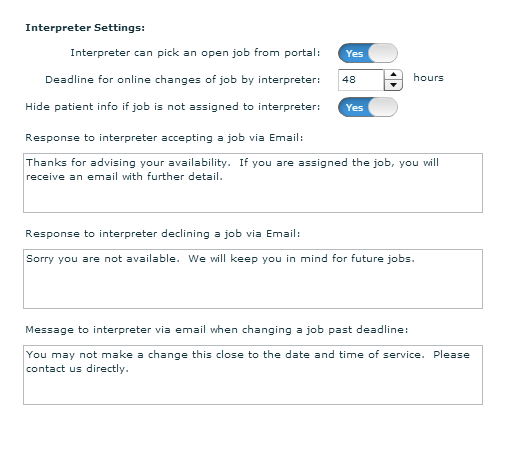 Hide patient info if job is not assigned to interpreter: You have the choice of how much information you want to reveal to the interpreter on the interpreter portal. If you have it set so the interpreter can pick an open job from the portal, but you do not want them to know who the LEP is until the job is assigned to them, set this to Yes. If you need for them to know who the LEP is in order to determine if they should accept the assignment, then set it to No. Response to Interpreter accepting job via email: This message will be displayed on the interpreter's screen when they advise they are available for a job which was sent via email. You can configure this email message reply, but it is not the same message sent in reply to their acceptance via SMS. You cannot edit the SMS message at this time. Response to Interpreter declining job via emal: Just the opposite circumstance of the message above. Message to Interpreter via email when changing a job past deadline: You set the deadline above for changes to a job and here is where you define the message they will receive letting them know they have to contact you to make changes this close to the time of the appointment. Default for show available job on portal: See the screen capture below. There is a checkbox on the Intperpreter tab of a Request. If it is checked, this job will show on the Interpreter Portal as an available job (if you have set 'Interpreter can pick an open job from portal' set to Yes). This determines whether that checkbox is checked or unchecked by default. You can always change that checkbox on the job manually to determine if a specific job is shown on not shown. 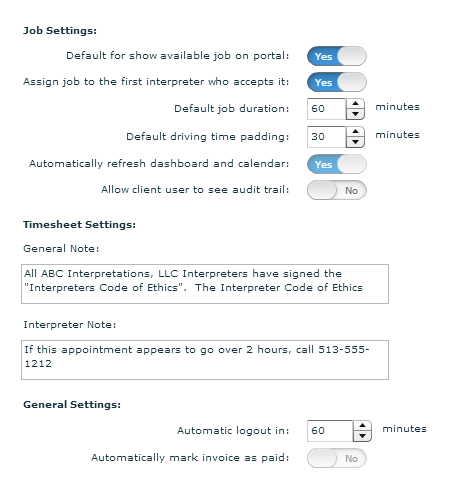 Assign job to the first interpreter who accepts it: If you set this to yes, when you offer a job to multiple interpreters by clicking the Send button next to their names on the Interpreter tab of a request, the first interpreter to reply affirmatively via email or text will automatically have the job assigned to them. Default job duration: This value is used to populate the duration of a new job when you launch the pop up by double clicking on a date and time in the calendar. Default driving time padding: To avoid booking jobs too close together for a single interpreter, this time is required between jobs when determining the availability of an interpreter. It shows in the lower left margin of the job pop-up. You can adjust it manually when searching for available interprerters. Automatically refresh dashboard and calendar: If this is turned on, every time a job is saved, the dashboard and calendar will refresh. This is both good and bad. If your database is not very large, then it will be fine, but if you have a large number of requests in the database, it will be inefficient to do this refresh. You can refresh manually by clicking the 'Refresh' button in the lower right margin of the Dashboard in order to see newly created jobs in your calendar or dashbo0ard view. Because it can have a dramatic effect on performance, we have disabled this setting and it can only be changed by someone from LSP Ware. Allow client user to see audit trail: If you allow client access, you can determine whether you want them to view the history of changes to a request or not. General Note: This is one of two fields that appear on a typical timesheet that you can populate with whatever boilerplate you would like. Interpreter Note: This is the other field you use to give standard information to your interpreter. Automatic Logout: The Atrium forces logout after the application is inactive for this period of time. The value may be set no higher than 120 minutes. Automatically mark invoice as paid: Rather than using Atrium to track and post payments for receivables, it may be more convenient to simply mark an invoice as paid in Atrium the moment it is created. This setting determines if that is the default behavior. Since this can have a dramatic impact on accounting, we have disabled the control for this and it can only be changed by LSP Ware personnel.